Our readings during this Easter season are a special delight because our first readings are always from the Acts of the Apostles, telling the story of the formation of the early Church. Our second readings are mostly from the First Letter of St. John, focusing on love and our relationship to God, remaining (living) in him and he is us. Our Gospel readings are from the Gospel of John, focusing on the true identity of Jesus, his relationship to the Father and our relationship to the Father through Jesus. In our first reading (Acts of the Apostles 9:26-31), we hear how the Apostles were afraid of this new convert Saul (Paul), who had formerly persecuted them with a vengeance. Now, since Paul's conversion on the road to Damascus (Acts 9:1), he "spoke out boldly in the name of the Lord." When Saul arrived in Jerusalem he tried to join the disciples, but they were all afraid of him, not believing that he was a disciple. Then Barnabas took charge of him and brought him to the apostles, and he reported to them how he had seen the Lord, and that he had spoken to him, and how in Damascus he had spoken out boldly in the name of Jesus. He moved about freely with them in Jerusalem, and spoke out boldly in the name of the Lord. He also spoke and debated with the Hellenists, but they tried to kill him. And when the brothers learned of this, they took him down to Caesarea and sent him on his way to Tarsus. In our Gospel reading (John 15:1-8), Jesus describes himself as the "true vine", us as the branches and the Father as the vine grower. Just as branches cannot live apart from the vine, so we cannot live apart from Jesus. If we remain (abide) in him, we will bear much fruit. Jesus said to his disciples: "I am the true vine, and my Father is the vine grower. He takes away every branch in me that does not bear fruit, and every one that does he prunes so that it bears more fruit. You are already pruned because of the word that I spoke to you. Remain in me, as I remain in you. 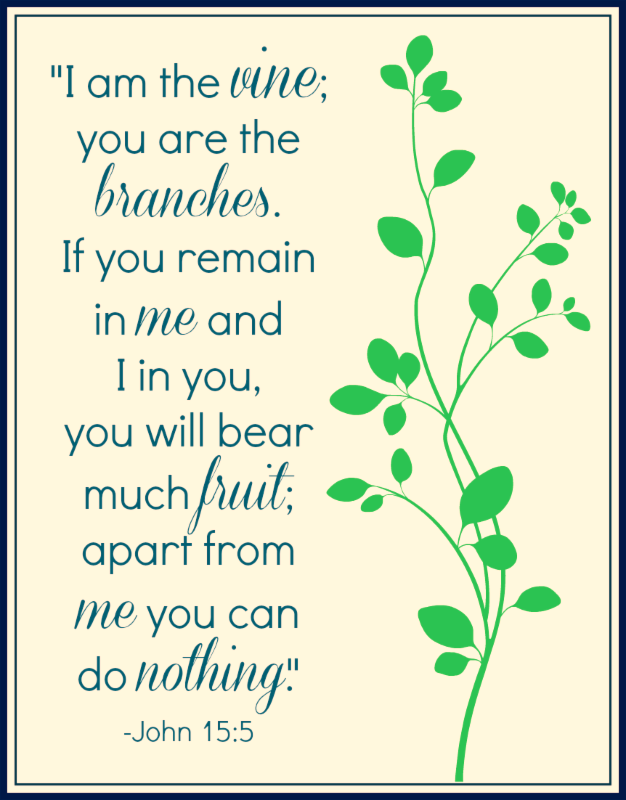 Just as a branch cannot bear fruit on its own unless it remains on the vine, so neither can you unless you remain in me. I am the vine, you are the branches. Whoever remains in me and I in him will bear much fruit, because without me you can do nothing. Anyone who does not remain in me will be thrown out like a branch and wither; people will gather them and throw them into a fire and they will be burned. If you remain in me and my words remain in you, ask for whatever you want and it will be done for you. By this is my Father glorified, that you bear much fruit and become my disciples." In our Epistle reading, (1 John 3:18-24), St. John lays out the intimate relationship we have with God - a relationship of Love. We are commanded to love one another. In so doing, and in believing in Jesus, the Christ, we remain (abide) in him and he in us. Children, let us love not in word or speech but in deed and truth. Now this is how we shall know that we belong to the truth and reassure our hearts before him in whatever our hearts condemn, for God is greater than our hearts and knows everything. Beloved, if our hearts do not condemn us, we have confidence in God and receive from him whatever we ask, because we keep his commandments and do what pleases him. And his commandment is this: we should believe in the name of his Son, Jesus Christ, and love one another just as he commanded us. Those who keep his commandments remain in him, and he in them, and the way we know that he remains in us is from the Spirit he gave us. We who live in the wine region of New York can especially relate to the metaphor of the vine, the branches and the bearing of fruit. We understand how the vine must be pruned in winter and we understand what happens to the branches that are cut off from the vine. We know the relationship the vine grower has to his vines and the grapes. We are called to believe in Jesus, the son of God and remain (abide) in him. What a comfort that is.